For variation, this love scene from Hokusai‘s The Adonis Plant (Fukujuso) takes place in the open air. The included text explains that the couple are lovers for three years but yet unable to wed. The man wears a black and white checkered kimono and headscarf, and they are still wearing their geta clogs. Even for this Hokusai album, the scene is a bit congested. It’s like the figures are trapped in a box. They display the quintessential Hokusai touch: memorable shapes among audacious kimono patterns. 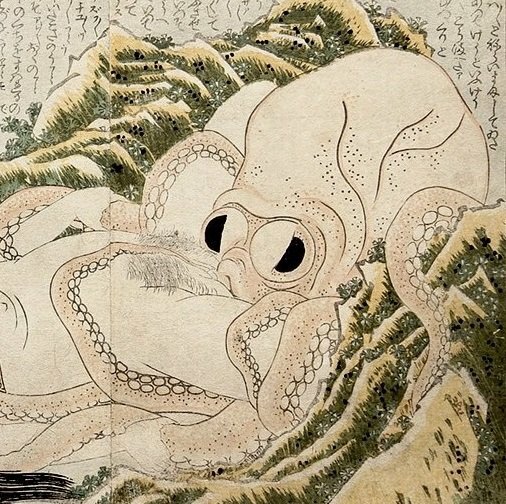 A rather similar scene appears in Hokusai’s Manpuku wagojin (Fig.2), although that one takes place inside with the lovers partially covered by heavy bedding. A couple of years ago I came a new book series by the artist (previously attributed to his daughter Oi) named Kuruwa no Tanoshimi that includes an illustration (Fig.3) that’s very reminiscent of the Fukujuso design. The only difference is the inclusion of an umbrella behind which the amorous couple hides. Click HERE for a masterful street scene from a decade earlier that’s part of Azuma nishiki (The Brocades of the East)…!!! Click HERE for more interesting content on Hokusai’s The Adonis Plant series…!! Who is your favorite shunga artist (and why)? Leave your answer in the comment box below!